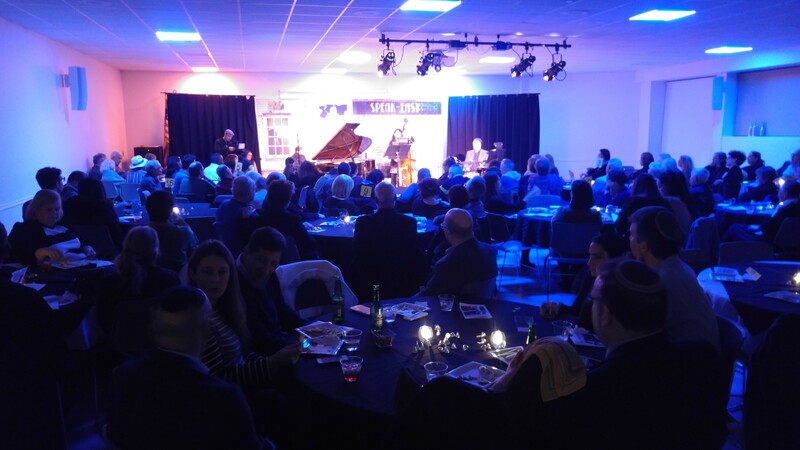 On November 16 The Riverdale Y was transformed into a cabaret nightclub to host about 130 people for Jazz Meets Broadway. Aficionados and first time Jazz goers were treated to their favorite Broadway tunes in a candlelit tangle of tables, drinks in hand, hors d’oeuvres at their fingertips. The event, produced once again by Gerry Goldsmith, was the perfect mix of talent, improvisation, and technique by three incredible musicians and a soaring Broadway soprano. Ted Rosenthal is the Artistic Director of Jazz at the Riverdale Y. This season’s hand-picked ensemble was terrific, as usual. Ted continues to mine the Jazz world to find the best performers for the Y, and this year was no exception. A late addition surprise to the program was vocalist Rachel Zatcoff, who recently made her debut as Christine in The Phantom of the Opera. She then moved directly into the role of Khanele in the Drama Desk-nominated The Golden Bride off Broadway. She is currently playing the role of Alice in The Secret Garden at Theatre Under the Stars. Rachel provided sensitive vocals, and helped Ted sample pieces from his soon-to-be released Jazz Opera. It’s typical of Ted’s ensemble to include a surprise guest who thrills the audience completely. The program sampled many of the great Broadway hits, all of which were treated to special Jazz interpretations by the musicians. It didn’t take long for Ted Rosenthal’s mastery of the piano to please. As his fingers raced across the keys at a speed few could imagine, the crowd was awed by his creativity and his capability. This season’s ensemble included Noriko Ueda, a Japanese-born bass player with credentials in classical piano and voice, who has won the BMI Foundation Charlie Parker Jazz composition prize. Ms. Ueda treated us to bass riffs that were intriguing and uplifting, and showed the audience the range of emotion available in that instrument. Tim Horner, one of New York’s most in-demand jazz drummers, kept the beat going strongly and added his unique solo riffs to prove that demand for his services is well-earned. Look for the next Riverdale Y Jazz Event in March, 2018. And get your tickets early; it could well be a sell-out. Check your weekly email from the Riverdale Y to be among the first to learn about our Spring Cabaret.